Civil Appeal No. 3253 of 2008. D/d. 6.10.2016. For the Appellant :- H.K. Naik, B. Vishwanath Bhandarkar, V.N. Raghupathy, Advocates. For the Respondent :- Ms. Kamakshi S. Mehlwal, Advocate. Pankaj Mahajan v. Dimple @ Kajal, (2011) 12 SCC 1. Vijaykumar Ramchandra Bhate v. Neela Vijaykumar Bhate, 2003 (6) SCC 334. Anil R. Dave, J. - This appeal has been filed by the Appellant husband, whose decree for divorce passed by the trial Court has been set aside by the impugned judgment dated 8th March, 2006 passed by the High Court of Karnataka at Bangalore in Miscellaneous First Appeal No.171 of 2002 (FC). before the High Court as she was aggrieved by the judgment and decree dated 17th November, 2001, passed by the Principal Judge, Family Court, Bangalore in M.C. No.603 of 1995 under Section 13(1)(ia) of the Act filed by the Appellant husband seeking divorce. 10. With regard to the allegations of cruelty levelled by the Appellant, we are in agreement with the findings of the trial Court. First of all, let us look at the incident with regard to an attempt to commit suicide by the Respondent. Upon perusal of the evidence of the witnesses, the findings arrived at by the trial Court to the effect that the Respondent wife had locked herself in the bathroom and had poured kerosene on herself so as to commit suicide, are not in dispute. Fortunately for the Appellant, because of the noise and disturbance, even the neighbours of the Appellant rushed to help and the door of the bathroom was broken open and the Respondent was saved. Had she been successful in her attempt to commit suicide, then one can foresee the consequences and the plight of the Appellant because in that event the Appellant would have been put to immense difficulties because of the legal provisions. We feel that there was no fault on the part of the Appellant nor was there any reason for the Respondent wife to make an attempt to commit suicide. No husband would ever be comfortable with or tolerate such an act by his wife and if the wife succeeds in committing suicide, then one can imagine how a poor husband would get entangled into the clutches of law, which would virtually ruin his sanity, peace of mind, career and probably his entire life. The mere idea with regard to facing legal consequences would put a husband under tremendous stress. The thought itself is distressing. Such a mental cruelty could not have been taken lightly by the High Court. In our opinion, only this one event was sufficient for the Appellant husband to get a decree of divorce on the ground of cruelty. It is needless to add that such threats or acts constitute cruelty. Our aforesaid view is fortified by a decision of this Court in the case of Pankaj Mahajan v. Dimple @ Kajal (2011) 12 SCC 1, wherein it has been held that giving repeated threats to commit suicide amounts to cruelty. 11. The Respondent wife wanted the Appellant to get separated from his family. The evidence shows that the family was virtually maintained from the income of the Appellant husband. It is not a common practice or desirable culture for a Hindu son in India to get separated from the parents upon getting married at the instance of the wife, especially when the son is the only earning member in the family. A son, brought up and given education by his parents, has a moral and legal obligation to take care and maintain the parents, when they become old and when they have either no income or have a meagre income. In India, generally people do not subscribe to the western thought, where, upon getting married or attaining majority, the son gets separated from the family. In normal circumstances, a wife is expected to be with the family of the husband after the marriage. She becomes integral to and forms part of the family of the husband and normally without any justifiable strong reason, she would never insist that her husband should get separated from the family and live only with her. In the instant case, upon appreciation of the evidence, the trial Court came to the conclusion that merely for monetary considerations, the Respondent wife wanted to get her husband separated from his family. The averment of the Respondent was to the effect that the income of the Appellant was also spent for maintaining his family. The said grievance of the Respondent is absolutely unjustified. A son maintaining his parents is absolutely normal in Indian culture and ethos. There is no other reason for which the Respondent wanted the Appellant to be separated from the family - the sole reason was to enjoy the income of the Appellant. Unfortunately, the High Court considered this to be a justifiable reason. In the opinion of the High Court, the wife had a legitimate expectation to see that the income of her husband is used for her and not for the family members of the Respondent husband. We do not see any reason to justify the said view of the High Court. As stated hereinabove, in a Hindu society, it is a pious obligation of the son to maintain the parents. If a wife makes an attempt to deviate from the normal practice and normal custom of the society, she must have some justifiable reason for that and in this case, we do not find any justifiable reason, except monetary consideration of the Respondent wife. In our opinion, normally, no husband would tolerate this and no son would like to be separated from his old parents and other family members, who are also dependent upon his income. The persistent effort of the Respondent wife to constrain the Appellant to be separated from the family would be torturous for the husband and in our opinion, the trial Court was right when it came to the conclusion that this constitutes an act of `cruelty'. 12. With regard to the allegations about an extra-marital affair with maid named Kamla, the re-appreciation of the evidence by the High Court does not appear to be correct. There is sufficient evidence to the effect that there was no maid named Kamla working at the residence of the Appellant. 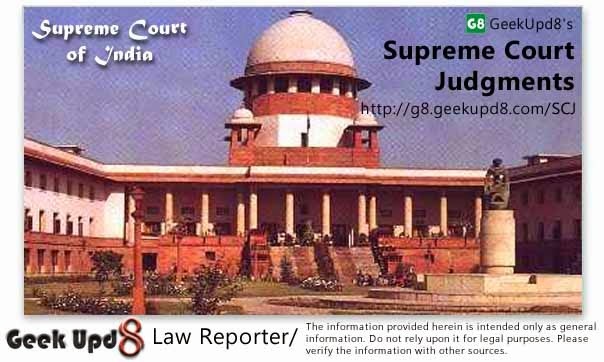 Some averment with regard to some relative has been relied upon by the High Court to come to a conclusion that there was a lady named Kamla but the High Court has ignored the fact that the Respondent wife had levelled allegations with regard to an extra-marital affair of the Appellant with the maid and not with someone else. Even if there was some relative named Kamla, who might have visited the Appellant, there is nothing to substantiate the allegations levelled by the Respondent with regard to an extra-marital affair. True, it is very difficult to establish such allegations but at the same time, it is equally true that to suffer an allegation pertaining to one's character of having an extra-marital affair is quite torturous for any person - be it a husband or a wife. We have carefully gone through the evidence but we could not find any reliable evidence to show that the Appellant had an extra-marital affair with someone. Except for the baseless and reckless allegations, there is not even the slightest evidence that would suggest that there was something like an affair of the Appellant with the maid named by the Respondent. We consider levelling of absolutely false allegations and that too, with regard to an extra-marital life to be quite serious and that can surely be a cause for metal cruelty. "7. The question that requires to be answered first is as to whether the averments, accusations and character assassination of the wife by the appellant husband in the written statement constitutes mental cruelty for sustaining the claim for divorce under Section 13(1)(i-a) of the Act. The position of law in this regard has come to be well settled and declared that levelling disgusting accusations of unchastity and indecent familiarity with a person outside wedlock and allegations of extramarital relationship is a grave assault on the character, honour, reputation, status as well as the health of the wife. Such aspersions of perfidiousness attributed to the wife, viewed in the context of an educated Indian wife and judged by Indian conditions and standards would amount to worst form of insult and cruelty, sufficient by itself to substantiate cruelty in law, warranting the claim of the wife being allowed. That such allegations made in the written statement or suggested in the course of examination and by way of cross-examination satisfy the requirement of law has also come to be firmly laid down by this Court. On going through the relevant portions of such allegations, we find that no exception could be taken to the findings recorded by the Family Court as well as the High Court. We find that they are of such quality, magnitude and consequence as to cause mental pain, agony and suffering amounting to the reformulated concept of cruelty in matrimonial law causing profound and lasting disruption and driving the wife to feel deeply hurt and reasonably apprehend that it would be dangerous for her to live with a husband who was taunting her like that and rendered the maintenance of matrimonial home impossible."